I don’t know how closely you follow the multitude of X-titles that are out, but this crossover completely changed the X-universe. Well, I guess House of M rocked the mutant world, but Messiah Complex sparked the rise in extremely well crafted X-Men stories. Messiah War? It started here. Second Coming? Right here. Avengers vs. X-Men? You betcha. The fallout from House of M included depowering all but 198 mutants in the Marvel Universe. At that point mutants went from a thriving community, to an endangered species. Not only did all but a handful of mutants lose their powers, but mutants were no longer manifesting abilities when they hit puberty. The mutant race was effectively a dying breed. Two years without any solution to the problem and Cerebra registers a new mutant with enough force to blow out its’ systems. 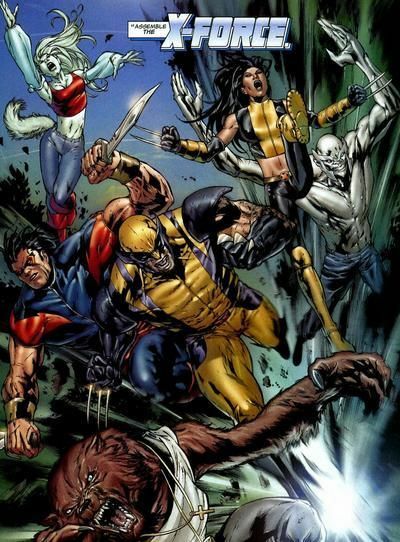 The X-Men arrive in Cooperstown, Alaska only to find the Marauders and the Purifiers have beaten them to the punch. The town has been razed and the X-Men discover the bodies of newborns the Purifiers killed leading them to believe it wasn’t a mutant manifestation, but a mutant birth. But since one baby was missing from the hospital, everyone begins hunting the person responsible for taking it: Cable. These 13 issues were instrumental in changing how the X-Men saw their world. Hope’s birth literally gave them hope that they were not the last of their kind. It turned Cyclops into more of a leader than he’d ever been. Sure, he’s primarily led the X-Men over the years, but now he is the leader of the entire mutant race. He’s the one who has to make the tough decisions to ensure the continuation of his people. One such decision was reforming X-Force. Initially Cyclops ordered Wolverine to reform X-Force to hunt down Cable, but after the events of Messiah Complex Cyclops kept the team together to actively seek out threats to mutant-kind and eliminate them before they were able to hurt any more mutants. X-Force could cross the line that the X-Men couldn’t. Cyclops’ decision to use X-Force ultimately led to internal conflicts with Storm and Beast, prompting Beast to leave the X-Men completely. I’d also argue that Cyclops’ willingness to have children as members of X-Force led to his falling out with Wolverine. Hope’s birth showed the mutant community that they might endure, but it also proved that their enemies were hell-bent on killing her. The Purifiers were willing to burn every child in Cooperstown to make sure they got the right one. The X-Men knew they had human enemies, but Messiah Complex revealed they also had a traitor in their midst. In the timeline Bishop grew up, all mutants were kept in concentration camps because of the Summers Rebellion. It’s revealed that Bishop harbors a desire to kill the mutant messiah he believes is responsible for the rebellion. Bishop ultimately fails in killing Hope when Cable transports himself and the baby into the future, but Bishop’s last shot at them seemingly kills Professor Xavier. He does manage to chase Cable into the future, and his pursuit of Hope is eventually what leads to her wanting to return to her proper time culminating in the Second Coming crossover. The X-Universe for the past 7 or 8 years has, for me at least, pumped out some of the best stories that Marvel has put out in a long time. While the mainstream Marvel Universe was still undergoing their Civil War to Secret Invasion to Dark Reign to Siege crossovers that changed the Marvel Universe for all the other characters, the X-Books were continually changing how mutants lived their lives in the 616. And it all started right here in Messiah Complex. I touched on the point about Cyclops becoming more of a leader earlier, but I want to expound on that now. Growing up, I watched the X-Men: The Animated Series, and like most people, thought Wolverine was awesome and Cyclops was lame. Even reading the older issues of the X-Men, Cyclops comes off as Xavier’s Yes-Man and is extremely boring. This all changed when he had to become someone who all mutants look to for leadership. There was a philosophy shift away from Xavier’s vision of “turn the other cheek.” Instead, he began embracing Magneto’s strike first mentality. This change in leadership made me a big fan of Cyclops, and has made the X-Stories more interesting, at least in my opinion. This all leads me into the original X-Men being brought to the future. Beast did this to try and show young Scott the kind of man he has become in an attempt to prevent him from turning into that person. But, I think Cyclops will use this as an opportunity to educate his younger self and affect his personality change sooner in an effort to prevent mutant deaths that occurred while he was still following Xavier’s dream. I could be wrong on this, but it seems the natural progression of his character. I guess we will have to wait and see what they have in store for the X-Men. Well written, and I agree. I would stress that “Avengers Disassembled” + “House of M” is the starting point or intro to get to Avengers vs X-Men and beyond (of course with Messiah Complex / War & Second Coming in between). That way you fully understand where mutants went and why Hope is so important – to mutants, Purifiers, and the rest! In other words, you’ll enjoy Messiah Complex even more with at least House of M (if not Avengers Disassembled AND House of M) under your belt first.